I think enough time has passed where I can talk about Brave, right? Spoilers below. Before I say anything, damn at those red curls. Awesome. 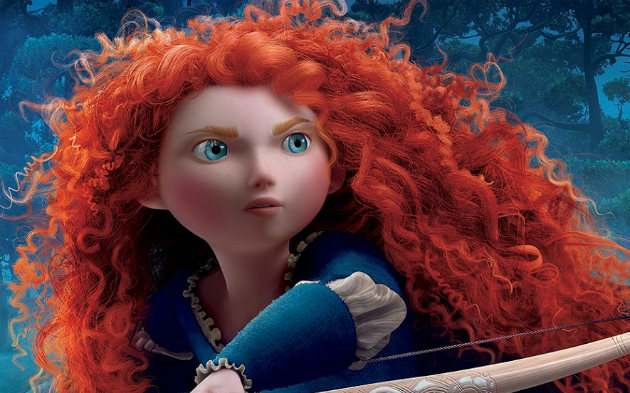 Now, there was some tumblr nonsense about how the Queen was abusive toward Merida, but I think that's total bunk. Someone is projecting, truly. What I saw was an historical (and very fictional) portrayal of life in a kingdom way back when. Yes, princesses were expected to act in a certain way. And it fell to the mothers to train them. So, when the headstrong teenager refuses to listen, the mother is going to get frustrated trying to explain to the girl in any way possible that there are things that need to be done regardless of personal wants and desires. This is something Merida herself comes to understand with time. And it's not like Merida is a slave. She's sassy, and she's allowed to explore her own creativity. She's given days just to herself where she can expand her own nature and become her own person. But when it's time for her to be responsible, her mother expects her to pull her weight. No harm, no foul. And while her stunts are funny to audiences, if my kids went directly against my orders out in public like Merida did, and the whole peace structure of the kingdom depended on them not doing that, well, I'd be pissed, too. When I first saw the movie, I was pretty ticked at Merida, because what the hell at giving your mom a spell-cake, especially when the two of you are so so close to opening up a dialogue. But, she's only a young teenager. I'd probably have done the same thing. I will say this, though, the next time I take my kids to a movie, I will check to see if HOLY CRAP GIGANTIC SCARY-ASSED BEAR FIGHT is in the reviews. Because wow. I had two little kids in my lap there. Even I was scared! I also bawled like a baby at the end. Even though I knew what was coming. Even though I knew there would be a happy ending. There I was, in the packed theater, another mom right next to me, and I'm all crying like whoa. I blame not getting out enough. The highlight of the movie, for me, was when my kid turned to me and said, "Don't worry mom, I would never turn you into a bear." Two thumbs up for Brave from this camp. We loved Brave, as well. And don't worry - I bawled like a child, too. Ella also told me she'd never turn me into a bear; words I'm sure she's regretted multiple times since then.